Sclerosol® Intrapleural Aerosol (sterile talc powder 4 g) is a sclerosing agent for intrapleural administration supplied as a single-use, pressurized spray canister with two delivery nozzles of 15 cm and 25 cm in length. Each canister contains 4 g of talc, either white or off-white to light grey, asbestos-free, and brucite-free grade of talc of controlled granulometry. The composition of the talc is â‰¥ 95% talc as hydrated magnesium silicate. The empirical formula is Mg3Si4O10(OH)2 with molecular weight of 379.3. Associated naturally occurring minerals include chlorite (hydrated aluminum and magnesium silicate), dolomite (calcium and magnesium carbonite), calcite (calcium carbonate) and quartz. Talc is practically insoluble in water, and in dilute solutions of acids and alkali hydroxides. The canister and delivery nozzles have been sterilized by gamma irradiation. 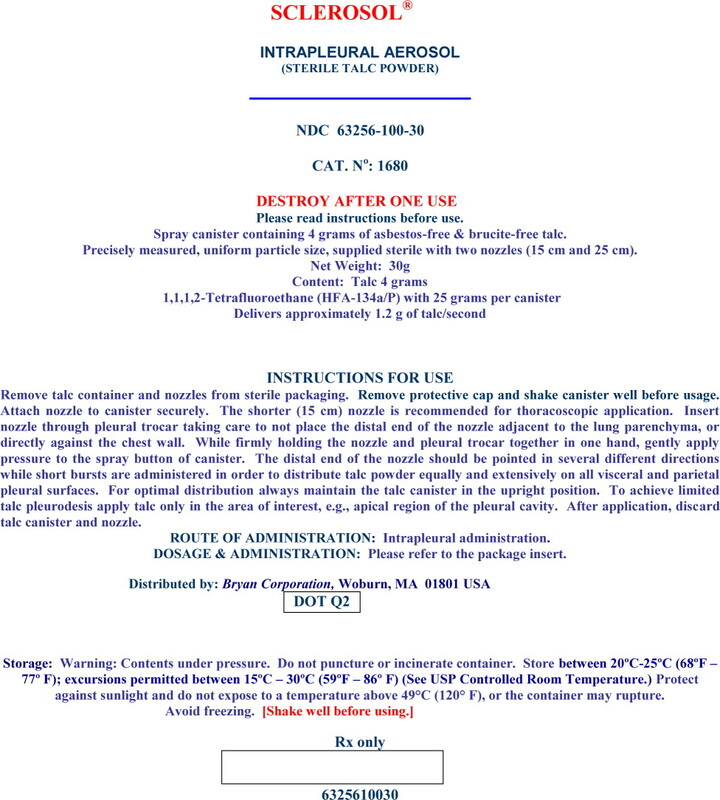 The aerosol propellant contained in Sclerosol® Intrapleural Aerosol is 1,1,1,2-Tetrafluoroethane (HFA-134a) with 25 g present per canister. The canister delivers 1.2 g of talc per second through the valve and the product contains no other excipients. The therapeutic action of talc instilled into the pleural cavity is thought to result from induction of an inflammatory reaction. This reaction promotes adherence of the visceral to the parietal pleura, obliterating the pleural space and preventing reaccumulation of pleural fluid. The extent of talc systemically absorbed after intrapleural administration has not been adequately studied. Systemic exposure could be affected by the integrity of the visceral pleura, and therefore could be increased if talc is administered immediately following lung resection or biopsy. The data demonstrating safety and efficacy of talc in the treatment of malignant pleural effusions are derived from the published medical literature. The following four trials were prospective, randomized studies of talc vs. a concurrent control, and provide sufficient detail for evaluation, including a clear, readily determined definition of response (no fluid reaccumulation by chest roentgenogram at one month or greater) and information allowing an analysis of all patients randomized. Talc was statistically significantly superior to the control arms in evaluable patients across the studies. In other studies, greater than 1000 patients with malignant pleural effusions have been reported (with varying degrees of detail and durations of response) to have had successful pleurodesis with talc. Sclerosol® Intrapleural Aerosol, administered by aerosol during thoracoscopy or open thoracotomy, is indicated to prevent recurrence of malignant pleural effusions in symptomatic patients. 1) Future procedures. The possibility of future diagnostic and therapeutic procedures involving the hemithorax to be treated must be considered prior to administering Sclerosol® Intrapleural Aerosol. Sclerosis of the pleural space may preclude subsequent diagnostic procedures of the pleura on the treated side. Talc sclerosis may complicate or preclude future ipsilateral lung resective surgery, including pneumonectomy for transplantation purposes. 2) Use in potentially curable disease. Talc has no known antineoplastic activity and should not be used for potentially curable malignancies where systemic therapy would be more appropriate, e.g., a malignant effusion secondary to a potentially curable lymphoma. 3) Potential pulmonary complications. Acute pneumonitis or acute respiratory distress syndrome (ARDS) have rarely been reported in association with intrapleural talc administration. Whether these were causally related to talc is unclear. In none of the reported cases was talc applied thoracoscopically or by insufflation. Three of four case reports of ARDS have occurred after treatment with 10 g of talc administered via intrapleural chest tube instillation. One patient died one month post treatment and two patients recovered without further sequelae. Intravenous administration of talc is a well-recognized cause of pulmonary hypertension and pulmonary lung parenchymal disease, but these complications have not been reported after intrapleural administration. Pulmonary diseases, e.g., silicosis or asbestosis-like diseases, chronic bronchitis, bronchogenic carcinoma, and pleural plaques have been reported in association with inhaled talc. 4) Contents under pressure. The contents of the Sclerosol® Intrapleural Aerosol (sterile talc powder) canister are under pressure. The canister must not be punctured and should not be used or stored near heat or open flame. Drug Interactions: It is not known whether the effectiveness of a second sclerosing agent after prior talc pleurodesis would be diminished by the absorptive properties of talc. Carcinogenesis, Mutagenesis, Impairment of Fertility: Studies on the carcinogenicity of talc have been performed using non-standard designs in which talc and its asbestos content were not fully characterized, preventing firm conclusions on its carcinogenicity. Tumor incidence in rats was not increased following either a single 20 mg injection with a 6 month recovery period or weekly injections of 25 mg for 4 weeks with an 84-week recovery period. Genotoxicity was assessed in cultures of rat pleural mesothelial cells (RPMC), as unscheduled DNA syntheses (UDS) and sister chromatid exchanges (SCEs). Asbestos-free talc was negative for genotoxicity under the conditions tested. No information is available on impairment of fertility in animals by talc. Pregnancy: Pregnancy category B. An oral administration study has been performed in the rabbit at 900 mg/kg, approximately 5-fold higher than the human dose on mg/m² basis, and has revealed no evidence of teratogenicity due to talc. There are, however, no adequate and well-controlled studies in pregnant women. Because animal reproduction studies are not always predictive of human response, this drug should not be used during pregnancy unless it is clearly needed. Pediatric Use: The safety and efficacy of Sclerosol Intrapleural Aerosol® (sterile talc powder) in pediatric patients have not been established. Geriatric Use: The mean and median ages of patients treated with talc in the clinical studies table were 50-62 years. No analyses to specifically evaluate the safety and efficacy in the geriatric population have been reported. Talc administration has been described in more than 1500 patients reported in the medical literature. Patients with malignant pleural effusions were treated with talc via poudrage or slurry. In general, with respect to reported adverse experiences, it is difficult to distinguish the effects of talc from the effects of the procedure(s) associated with its administration. The most reported common adverse experiences were fever and pain. Almost all of the cases of fever, and over half of the cases of pain, were in patients who received diagnostic biopsies at the time of talc administration. Infections: Empyema was a rare complication of talc administration and/or the procedure. Biopsies had been obtained prior to onset in over half the reported cases. Respiratory: Rare instances of pneumonia, ARDS, dyspnea, bronchopleural fistula, hemoptysis, and pulmonary emboli have been reported. Cardiovascular: Tachycardia, myocardial infarction, hypotension, hypovolemia, and asystolic arrest associated with surgery and/or anesthesia have been rarely reported. Delivery Procedure: Adverse reactions due to the delivery procedure and the chest tube may include: infection at the site of thoracostomy or thoracoscopy, localized bleeding, and subcutaneous empyema. Chronic Toxicity: Lange et al. (Thorax 1988;43:559) reported on 114 consecutive cases of idiopathic spontaneous pneumothorax treated with talc poudrage (60 patients), or simple drainage (54 patients) via an intercostal tube. Pulmonary function tests (FEV1, VC, TLC, and RV) 22 to 35 years after treatment, showed no significant differences in the incidence of pleural changes between the two groups. Two patients treated with talc poudrage had more extensive pleural thickening with calcification. The mean total lung capacities were 89% of predicted in the talc group and 96% in the drainage only group. Fourteen patients (12 lifelong heavy smokers, 2 non-smokers) had airflow limitation (5 severe). Source and purity of the talc used was not reported. No cases of mesothelioma were reported. One case report noted the occurrence of adenocarcinoma of the chest wall two years after pleurodesis following 10 g of 1% iodized talc (administered for recurrent pneumothorax). Overdosages have not been reported. See PRECAUTIONS: 3) Potential pulmonary complications. Sclerosol® Intrapleural Aerosol (sterile talc powder) is administered after adequate drainage of the effusion. It has been suggested that success of the pleurodesis is related to the completeness of the drainage of the pleural fluid, as well as full reexpansion of the lung, both of which will promote symphysis of the pleural surfaces. The usual dosage of Sclerosol® Intrapleural Aerosol (sterile talc powder) is a single 4-8 g dose delivered intrapleurally from the spray canister (1-2 cans), which delivers talc at a rate of 1.2 g per second. Shake canister well before usage. Remove protective cap and securely attach actuator button with its delivery nozzle (either 15 cm or 25 cm) to the valve stem of canister. Insert delivery nozzle through pleural trocar, taking care not to place the distal end of the delivery nozzle adjacent to the lung parenchyma or directly against the chest wall. While firmly holding the delivery nozzle and pleural trocar together in one hand, gently apply pressure to the actuator button on the canister. Sclerosol Intrapleural Aerosol® is not delivered by metered dose, but depends on the extent and duration of manual compression of the actuator button on the canister. The distal end of the delivery nozzle should be pointed in several different directions, while short bursts are administered in order to distribute the talc powder equally and extensively on all visceral and parietal pleural surfaces. For optimal distribution, always maintain the Sclerosol Intrapleural Aerosol® (sterile talc powder) canister in the upright position. After application, discard the canister and delivery nozzle. The duration of chest tube drainage following talc sclerosis is dictated by the clinical situation. NDC 63256-100-30: Sclerosol® Intrapleural Aerosol (sterile talc powder) contains 4 g of talc suspended in 25 g of inert propellant in a single-use aluminum canister. The canister is fitted with a continuous spray valve which delivers approximately 1.2 g of talc per second. This canister, attached to an actuator button, and two delivery nozzles of 15 cm and 25 cm length, are supplied in a sterile, flexible plastic peel pack. STORAGE: Warning: Contents under pressure. Do not puncture or incinerate container. Store between 20°C - 25°C (68°F - 77°F); excursions permitted between 15°C - 30°C (59°F - 86°F) (see USP Controlled Room Temperature). Protect against sunlight and do not expose to a temperature above 49° C (120° F), or the canister may rupture. Avoid freezing. Shake well before using. Description: Spray can containing 4 g of asbestos-free talc. Precisely measured & uniform particle size. Spray canister containing 4 grams of asbestos-free & brucite-free talc. Precisely measured, uniform particle size, supplied sterile with two nozzles (15 cm and 25 cm).